Set only a few blocks away from the Santa Monica beach, this bustling and lively restaurant is the perfect ambient for brunch. Insanely busy, yet driven by attentive servers, Brick + Mortar was the closest thing to paradise on an early Saturday morning. With impeccable service and exceptional menus, it left me and my friends with nothing to wish for. The city-rustic place buzzes with a juvenile crowd and welcoming servers. There are lots of TVs around so that people could watch sports games, and a trendy DJ inside a cozy little wine cellar. The place is loud and overflowing, but that gives it a cool ambiance for brunch. On the Saturday that my friends and I chose to visit, it was barely 1 p.m. and there were already groups of people doing shots by the bar. 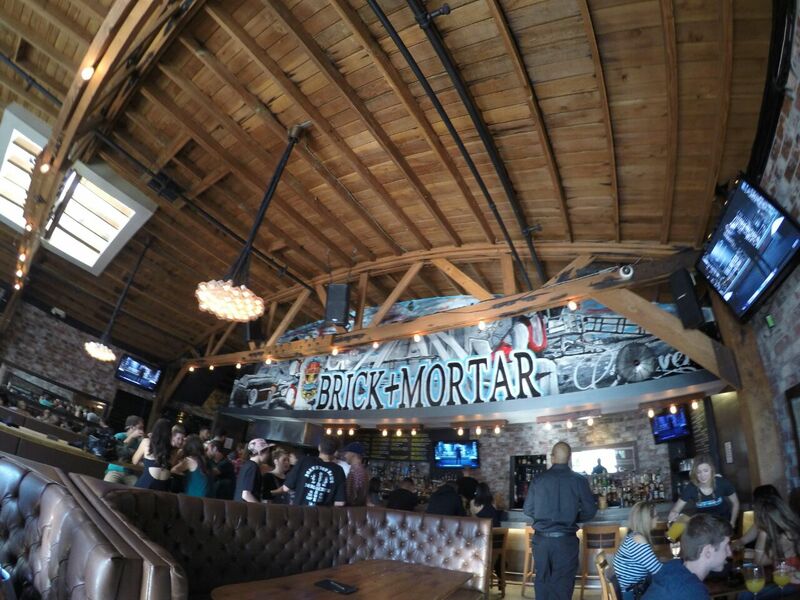 Brick + Mortar has three different types of environments, accommodating anyone and anything. Those who want less vibrancy and clamor and would much rather enjoy brunch alfresco, under the Santa Monica sun, sit outside. Inside, guests can choose between sitting in a table with your party, or sitting at a long wooden table that was being shared by different crowds. At first, we decided on the communal table, but soon figured that it was too brisk for us and moved to a more private table by the corner. We were six people at the table, and none of us could decide what to order. Problem was, we wanted it all. Brick + Mortar is one of those places in which everything on the menu is so appealing that you wish you could just order one of each. I finally decided to go with the French toast with berries compote, maple butter and bacon. Just a few minutes later, four thick slices of French toast arrived on a plate. The funny thing is, I’m very picky when it comes to French toast. A part of me just knew that I was going to be disappointed by what I had ordered. Brick + Mortar, however, satisfied my craving perfectly. It really doesn’t get any better than this. The toasts had a fluffy interior that melted right when I put a bite of them into my mouth. It was the perfect mix between being perfectly toasted on the outside and warm and soft on the inside. And I wish I could talk about the bacon, but my friends attacked it right when the plate touched the table, and I didn’t even see when it went missing. I guess the velocity in which it disappeared from my plate means it was pretty good. The table went silent for a few minutes, given that everyone was so intent on enjoying their foods. Overall, Brick + Mortar provided a pleasant experience for brunch and I would definitely go back. Plus, there’s no better way to start a Saturday than with $15 bottomless mimosas.